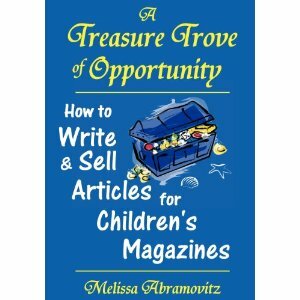 How I wish I had Treasure Trove when I was first starting out writing articles for children's magazines. Ms. Abramovitz guides the novice writer through the basics, then hones in on the practical details from idea to publication and the numerous steps in-between for the remainder of the book. She gives examples and anecdotes from her own work and various other children's authors to make the process transparent. I will be recommending this to all my students who are interested in writing nonfiction. So many of us start out writing the Great American Novel. Nothing wrong with that, of course, and I know authors who've sold their first ever novel. But for the vast majority, it is good to learn the elements of good writing by writing short stories and articles. And if you peruse magazines you will find that 80% of the content is nonfiction. What editors receive 80% of the time is fiction, though. I know we all yearn to write our own stories, but if you have a special interest in science or languages or math, try writing a well focused piece on it for children. I am so glad that the ICL course makes the students work on at least one nonfiction piece, and by far, these are the ones that my students sell. And many of my students who professed they did not like to write nonfiction get a bug for it. Give it a whirl. You will not be disappointed. And Treasure Trove will be a perfect companion for you as you navigate the world of children's magazines. I cut my writing teeth on magazines and will forever be grateful for the opportunity to learn how to write clean and tight prose on deadline. I pretty much learned on the job, from the editors of Ladybug, Highlights, Odyssey, and many others. And I still write for magazines, though not as much because writing time is limited and I want to focus on my bigger books, but ideas hit me all the time, and all of them are not necessarily book worthy, so it's fun to explore these ideas for a magazine. Healing Water: A Hawaiian Story by Joyce Moyer Hostetter is something I picked up for myself at the Write 2 Ignite conference. I love historical fiction and had already read Blue and Comfort, so I was intrigued by this story of a boy who had been banished to Molokai when he showed the signs of leprosy. What a story! Of love and betrayal, of separation and loss, of a boy turning to crime, hardening his heart, and then finding a way to forgive with the help of one of my favorite saints -- Father Damien. I had read a biography of Fr. Damien when I was about eight or nine years old, and have learned a fair bit about leprosy in my medical microbiology book, but I had no idea how lawless this place was, and how incredibly difficult it must have been to go there as a child, knowing that you are to live and to die there. Ms. Hostetter weaves a beautiful story of healing love. God's love. It was such a pleasure to talk to her, and she was incredibly gracious, reading many pages of my current manuscript and offering advice. Thank you, Joyce, and God bless. “We’re almost done. The nurse will give you the pills and we can go home. Okay?” I try to get as much of the gel off Joy's belly and clothes. I know how awful it is to have anything done to your body. I remember screaming through all my debridement. They’d soak me in a tub and my rotting skin would peel off. What dead skin didn’t come off had to be scrubbed off. It was done daily to prevent infection. I was just a kid, but they’d hold me down anyway, and rub away my stinking flesh. I wonder how I survived as I scrape the paper towel over Joy’s belly one last time. When I go to throw away the goopy towels, I look at the screen. It has the last shot, a grainy one, showing an almost empty cavity shaped like a giant kidney bean with a couple of blobs inside. One looks like a shrimp. The other blob is much tinier and round. Joy stands beside me. “Is that the baby? “Must be,” I say. “But right now, it’s just a bunch of cells clumped together. It’s not anything special.” I take a pen from the counter and draw on the paper sheet Joy had lain on -- two little circles, then four, eight, and finally a donut. “That’s how it begins. It’s just a cluster of cells.” But even as I say it, I marvel at how they know to become a pinky or a big toe. Most everybody I know has already posted excerpts. If you haven't, please consider yourself tagged and let me know. I've enjoyed reading everybody's wips. Here are the rules if you want to play. 1. Go to page seventy-seven of your manuscript. 2. Go down seven lines. 3. Post the next seven lines, sentences, or paragraphs on your blog. 4. Tag seven new writers. Thanks Faith. Now I've improved seven paragraphs of my wip! Progress! It's been a month since the Write2Ignite conference and it's nice to have my notes with me to remember a few things. Janice and I got a wee bit lost in Greenville because my directions were not clear. Thank goodness for her cell phone that had a built in GPS because we were able to find our way to the hotel. I had planned on having a cup of tea and taking a nap after the long drive, but I didn't want to miss the keynote, so tea was all I had. And it was worth it to miss the nap just to hear Kristi Butler speak. What energy! And how wonderful to begin with prayer and being aware of God's call in our lives. The best part was that she compiled a list of Scripture passages so that we could be reminded of God's promises. I will most likely put them on a separate permanent page on my blog. She says she has them taped to her bathroom mirror, and I think I might do that myself. Kristi was such a generous soul -- she gave us each a feather to remind us not to let our dreams turn to dust and a river stone that she wrote "Remember" on. Both are in my office now ... along with my stones that say: Dream, Courage, and Peace (I picked out these other river rocks when I went through RCIA). So, aren't these lovely things? I have pinned the feather to my bulletin board to keep it safe from the cat. And the Welch sisters (Donna and Rachel) led us into a song. What lovely voices. The breakout sessions that I went to were geared towards beginners and intermediate writers, and I tell you, no matter how long you've been writing, it is always good to be reminded of the basics. This is part of the reason why I love teaching at ICL so much -- when I preach about pacing or showing or being true to the characters, I am reminded to practice it in my own writing. Endings should be satisfying, tinged with dissatisfaction. Think yearing. Plot is what, driven by the so what? Challenges us to tell the truth -- emotional and spiritual along with the factual. I recommend you invest in a copy of Sowing Seeds by Kathleen Muldoon if you are interested in writing for the Christian magazine market. And remember that the consequences of choices the characters make must reflect the Biblical worldview. That's what makes it Christian fiction. I almost forgot -- I won a drawing and came home with a lavender bath spa kit. My daughter was the first to use it! Such a treat. Thank you, Write2Ignite team. Alrighty, that's it for now. I have a novel to revise before school ends. Easter joy and blessings to all. This afternoon, my daughter brought in a packet from John Wiley. "Is this an Easter present for me?" she asked. Both my children know that I buy books as gifts and know not to open packages that come in the mail. Or else suffer my ire. I told her, yes, but it was for me! But she was the first to read my essay in a bound book form. I tell you, nothing can replace the smell and feel of a new book! My daughter told me she still does not like spicy food, which is true, but nothing stops her from dipping her dosa into a spicy sambar, just to get a taste. Reading My Mother's Eggplant again made me realize how much I've gone through these past five years. I am no longer the same person as when I wrote it. Of course, the essay still holds true, but if I were to write an essay about motherhood and legacy now, it would be different. It would reflect my Christian worldview. I am so blessed that the editors chose my essay to be in the book. It was a great joy to take what I thought was a polished piece and make it even better. Thank you, Dan and Mary Jo Gediman. I hope to contribute more essays to This I Believe ... and so can you! Tonight on our evening walk, I couldn't help but think how I begin my rosary or various other chaplets by first professing the Apostles Creed. I believe in God ... everything else stems from this. If you spy this book in the bookstores, let me know. All my other books are of the educational variety (for the school and library market) so they are not carried by bookstores. Happy reading and God bless mothers everywhere. I am finally getting around to posting reviews on Amazon and thought about cross-posting. This is the most beautiful coloring book for children to inspire them to grow in their Catholic faith. The drawings are detailed and there is enough variety for a child of 2 to a child of 99 to spend hours coloring these. They make beautiful Christmas and Easter gifts. I am a repeat buyer since I have not seen any other coloring book of religious art with such beauty. I had the pleasure of seeing the actual quilt and it is amazing. What a family treasure! But you do not have to be a quilter to enjoy this book with a child or a grandchild. Janice Green has retold the Creation in her own words using the quilt blocks to illustrate. Children will not only delight in the story, but they will be eager to discuss the questions that Ms. Green poses on each page spread. Ms. Green also gives several ideas on making your own quilts or tracing pictures for the children to color. This makes a wonderful baby shower gift, especially to those mothers who love to sew. 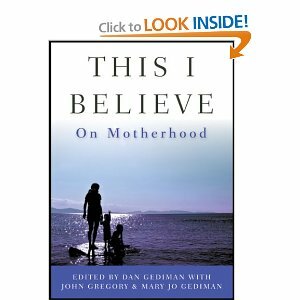 This is a book I will be purchasing again and again for young mothers. Both these books make lovely gifts for children. I hope you will consider getting a copy to share with a beloved child. Thank you so much and I hope you will have a most blessed Holy week and a joyful Easter. I am especially enjoying practicing songs for the Triduum. It is such a blessing to sing in a choir again. I'm also discovering the power of the Gregorian chant in alleviating pain. Wow!